I'm looking for some design ideas for 4'x2' acoustic panels. Specifically how to build a frame with minimal cost. I have 2 cartons of OC 703 1" I was planning on building 2" and possibly 4" panels and maybe some corner traps. If you want a basic rectangular panel, just get some 1x4's, build a box with a crossbrace, and put 2" of OC703 in it. I put some 1x1's behind the fiberglass to hold it in place. 2" OC703 doesn't need them, if it's cut to fit snugly, but 1" isn't as rigid and will probably need some help. By spacing the OC703 2" off the wall, you'll get much better lower-end absorption than you get with 2" on the wall. 2" of air and 2" of OC703 is better than 3" of OC703, and almost as good as 4", if I remember right. http://www.bobgolds.com/AbsorptionCoefficients.htm has lots of absorption coefficients, though it doesn't have numbers for 2" off the wall. I decided a rectangle would be boring so I made mine diamond-shaped. Then wrap it in black grille cloth (Parts Express is cheap) or other cloth, and you're good to go. Um, no -- rhombuses. Rhombi. 2 * rhombus. So is it better to not have a back board? I've read about the 2" panel stand off so the panel can absorb in two directions, as the sound wave comes then reflects. I'm focusing on the frame because I have it in my mind that I need a frame so I can pull the speaker cloth tight. Kal Idea looks very easy. Are there pro's and con's to having a back board vs. an open back? improves lower frequency attenuation - you will lose both advantages with a closed back. Look into getting GoM fabric, it is acoustically transparent and has an architectural fire rating. Also, some tightly woven "grill cloth" can actually tend to reflect the higher frequency energy. Nope AR, see http://en.wikipedia.org/wiki/Rhombus and http://en.wikipedia.org/wiki/Trapezoid. Totally different shapes. AFryia, my "open back" panels still have a back surface -- the wall. I don't think there's any difference between having an "open back" panel on the wall, vs. a "closed back" panel on the wall, assuming the material & spacing in FRONT of the back is the same. E.g. if you built a panel with 2" of OC703, 2" of air, and a hardboard back surface, I believe it would work 99% the same as my panel with 2" OC703, 2" air, and wall. The higher freqs will bounce off the backboard or wall about the same, and the low freqs will pass through them both about the same. Kal's panels will have different performance not because of the back board, but because of the different material -- thickness and absorption properties -- and because of the lack of an air gap. Kal's panels should work fine for high freqs but will have much less absorption at lower freqs than mine. The tables at http://www.bobgolds.com/AbsorptionCoefficients.htm give you a good idea what these materials can do. 2" of OC703, on the wall, absorbs everything above about 300-400Hz. Space it off the wall and it lowers the freqs it absorbs. So I think I'm going to pull the fabric all the way around to the back of the panel. So I could build the frame out of any material as it will not show. What material would be the most cost effective? OSD, MDF pine, other? I'm thinking a picture frame style open back. I just built a simple rectangle (or diamond) of pine 1x4's, then wrapped with fabric. The fabric also protects the wall in case I want to move them in the future. These guys REALLY helped me when I was trying to treat my room. I have a pretty gnarly IB sub and with the panels and concepts I learned from the infinitely baffled crew my rooms acoustics are so much better. I built the units with the pegboard backs. They work really well. I'm no acoustic engineer by any stretch but a couple of my friends are professional musicians and they love the sound of the theater room even when there is no movie on. The room has a VERY different feel to it with the panels. I also use the tube style bass traps in the corners. I will eventually use the triangles in the corners too. Heres a link to the forum. You have to register but it's no big deal. 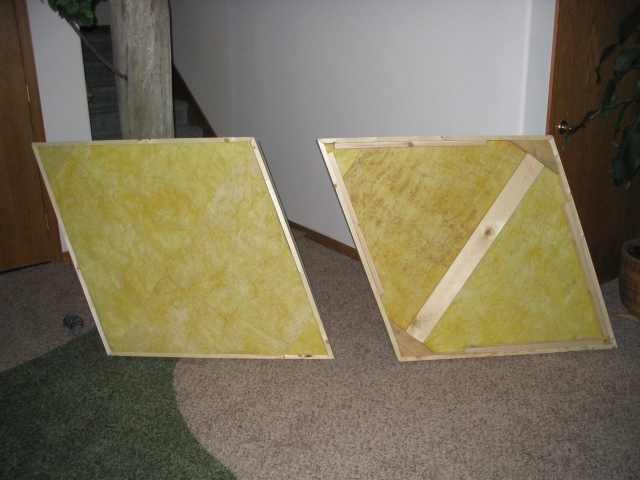 Then there is a section on the forum about diy panels.